Starting the 3rd Annual Singapore edition on a high note, Jezamine Fewins, Partner at Stephenson Harwood LLP Hong Kong was interviewed by Gabriel Dufourcq, Private Collector & Curator of a Vintage Photo Collection. 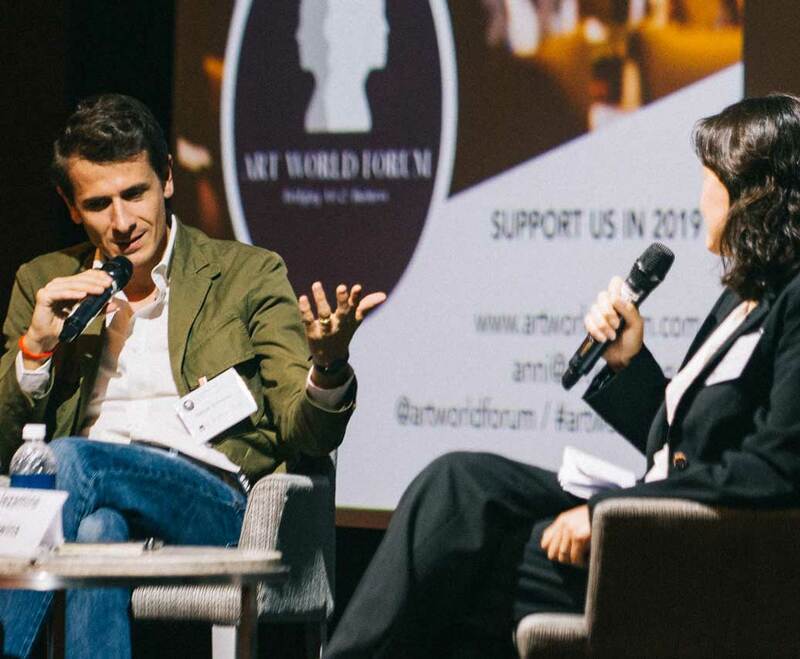 Their discussion addressed art as an investment, buying and selling strategies and financial avenues. Gabriel: Buying art is not just investing money. It is also losing money. And spending money more generally. I’d say collecting is a personal thing. Jezamine, do you see art as an asset? Are we talking about value, investment, finance…. Jezamine: Regarding my clients, their interest in investing and whether the works they are looking at are in fact assets, they are essentially looking to plant their money hoping it will grow in value in the long term. Long term typically refers to 10-20-30 years but in the context of art, it is much shorter. A lot of them are looking at a little less than 5 years and whether they can get a return on their investment. Generally, if you’re considering traditional investments like stocks and shares, you can normally get dividend or something that pays out on an annual basis. Obviously art is very different. You can buy a painting or a sculpture but the likelihood of getting a yield from that depends on who you are buying the work from. Occasionally art entities with extensive contacts in banks or large law firms will try lease out the works and give you an annual yield; We are looking at less than 5% a year. Most of these investments don’t produce a yield unless you work with companies keen on reselling the works. Gabriel: You are referring to financial companies, stock markets, bonds – all rather technical references. What about the estimations of works? The Affordable Art Fair for example caters for a lower-tiered market, do you think there are boundaries between experts and the so-called “Sunday buyers”, people who buy decorative items through galleries who are convinced they are solid investments? The problem is these people have no knowledge or exit strategy if they are looking to retrieve the value of an asset. Buying a work for $15 – 20,000 with the intention of liquidating it a few years later, they are effectively stuck. Do you think there’s an imbalance between the public and buyers of art? Jezamine: I think there is. Anyone looking to invest in art has to consider what kind of artist they want to invest in. Focusing on emerging artists for instance, there is potential to make a lot of money. However, identifying the next big emerging artist is like betting on a lottery ticket –it’s difficult to do! Mid-career artists who have sold work through galleries or at auction means that gallery prices are confidential whereas auction results are public. You can therefore only consider the value of the artist on the basis of his last work sold at auction. This doesn’t mean that the next five pieces that come onto the market are going to perform as well; artwork is very subjective. That said, some artwork is objective and it’s acknowledged by everyone as being of premium quality but at the same time, certain works of the same series can be of dubious quality. With blue-chip artists, profits yielded from a work are generally quite low in percentage. Gabriel: When owning works by blue-chip artists, it is a full-time expense. Jezamine: A lot of investors, especially Sunday Collectors don’t realise the amount of expense that you can incur when deciding to collect. Buying a blue-chip artist, insurance is a hefty cost. Otherwise you are running a very big risk. Likewise, some collectors put all their work in storage so again, the cost of storage depending on the size of the artwork is something you have to take into account. Once you have decided the type of artist you’d like to invest in and where you will keep it, you need to consider who you are buying works from. Consider the authenticity and its condition. With examples like Allen Howard, a hedge fund manager who paid $43 M for a Claude Monet and landed a court case. Gabriel: Im not sure how many people here are buying Monet’s for $43M; if you are, please come see me. The art world in this discussion is picking on corporate and entrepreneurial aspects with an exit strategy. How do you think buyers can resell their artwork? Jezamine: The exit strategy is the big question mark. There is no real art index that can value any piece of art. For anyone with work from a mid-career artist, looking at auctions would be your first reference also taking into account that selling through auction means there is a premium that needs to be paid. Selling your art, you might have an idea in mind of what you think the work is worth, but should there be no buyers willing to pay it, then it’s a matter of renegotiating. If you’ve been leasing the work to businesses it may be that someone in the company wants to buy it. Either way, you ought to increase the work’s publicity. If you only have one or two works, it’s tough but with a collection it’s easier to generate the interest. My advice would be to contact potential galleries and exhibitions long before a potential sale to increase the buyers’ interest. Gabriel: A collector may try minimising the risk by collecting both blue-chip and emerging/mid-career artists. Keeping the theme consistent throughout the collection creates a portfolio of value. In my own collection I have 400 photographs and not all of them have the same value. The big pending question I have is if I had to resell the collection, would I do it piece by piece, or all in one?” what is your view on balancing the value. Jezamine: A lot of collectors buy out of passion rather than the resale value. I think it depends on the reasons why you’re swaying toward an exit strategy. Is it because you’re selling on the basis of focusing on an artist or a different kind of work, or is it that you need the money. To some extent then you need to rely on what market experts tell you. Gabriel: Finally, is art a valuable investment? Jezamine: It can be. For the majority of my clients, they do it for the love of art. If there’s an increase in value, then that’s the cherry on the cake. If you’re collecting because in 5 years you’re expecting a substantial profit, you’ll need to be disciplined and conduct a lot of market research. The value might go up but it might also go down and you won’t be able to change that. Anyone investing in art needs to get to grips with what their rights are.